In the late 19th century, The Hearst and Pulitzer newspaper chains started writing articles about the terrible conditions found in Cuba. They repeatedly produced bizarre stories and major headlines decrying the Spanish occupation. The repeated accusations (many of which were false--If they didn't have anything to say they simply made it up) stirred up the American public and soon reached a crescendo (very similar to the TV media feeding frenzies that we have lately seen regarding Clinton, Diana, El Nino etc.). President McKinley and Secretary of War, Long, sent the Battleship Maine to Cuba to investigate the charges. While anchored in Havana harbor, the Maine blew up. To this day, we do not know the reason for this, but the newspapers said that it was the Spanish (despite considerable evidence that it was the Maine's own boiler). The American public was soon demanding war with Spain. President McKinley and the Spanish government did everything possible to avoid a war and even offered to pay for the Maine and to allow international investigations etc. But the media feeding frenzy was too great and soon we declared war on Spain. Many spoon variations were made to commemorate the Battleship Maine. Pictures of two engraved bowls are below. Admiral Dewey tea caddy spoon with his flagship the USS Olympia in the bowl. This spoon is unknown metal--not silver. 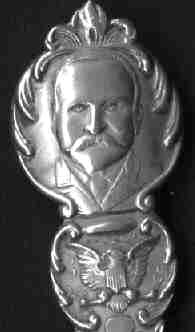 This spoon has a portrait of Admiral Dewey above the American Eagle and shield. 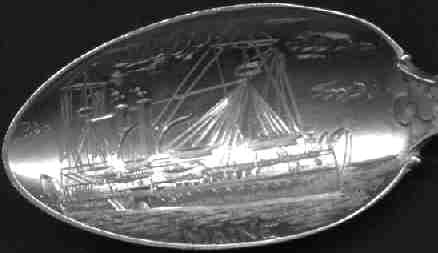 The bowl shows seven ships which are named "McCollough, Petrel, Raleigh, Olympia, Baltimore, Boston, Concord" with the slogan "Victorious in the Philippines"
A number of other spoons were created regarding the Spanish American War and some of them are shown on other pages on this site.